Dr Michael Szollosy from the University of Sheffield reviews a new science fiction film. Those film-goers that are enthusiastic about robots should probably buy popcorn in bulk, because we’ll all be making several trips to the cinema this year. We’ve already had Ex_Machina and Big Hero 6. We have Avengers: Age of Ultron and Terminator: Genisys to come. And now we have Neill Blomkamp's Chappie. Blomkamp is developing a reputation as a science-fiction director of note, having already helmed the excellent District 9 and perhaps slightly less excellent Elysium (though the director himself admits that he should have done better with that one). Blomkamp has now been offered the Grand Prize of sci-fi cinema, a chance to sit in the chair for the Alien reboot, so Chappie is a film that, despite a silly name, is demanding to be taken seriously. I have to admit to approaching this film with certain trepidation, watching in the trailer a naïve robot learning to be down with da kids and walk like a gangsta. But I decided to give Blomkamp the benefit of the doubt, the magnanimity granted in no small part on the film’s terrific cast (including the compelling Sharlto Copley), but also because of Blomkamp’s previous endeavours: from a roboticist’s perspective, Blomkamp has a history of making dystopian not-so-much fantasies that pose very interesting questions about how we imagine ourselves getting along with intelligent, mechanised creatures that increasingly play a part in our everyday lives. Blomkamp regards human nature from the ‘blank slate’ idea that violence is something we come to learn, rather than something innate with which we are born. His robot is a vehicle through which he explores these ideas, and on that level – as a fable or an allegory – the film works very effectively as an entertaining way to look at lofty questions about human violence. And that’s fine – a good science fiction film will always say much more about human beings than it does about aliens or sentient robots or robots or wizards or any of that lot who, let’s be honest, might not even exist. So Blomkamp probably isn’t really trying to say profound things about AI and robots. But then you do not expect Aesop’s fables to provide profound insights into the nature of talking foxes. However, some films have managed better to ask some deeply intriguing questions about AI. Ex_Machina, for example, is first and foremost a story about crises of masculinity, and about the relationship between master and slave, but nevertheless forces us to look seriously at the issue of artificial intelligence. Ex_Machina succeeds where Chappie fails for two reasons. First, the artificial intelligence in Ex_Machina is allowed more room to, erm, breathe. You do not look at Alicia Vikander’s biomechanical face and think that she is merely a symbol. You are watching a plausible, artificial intelligence emerge from the wires and gears. Which leads to the second problem with Chappie: the robot’s birth is so miraculous that you cannot really credit that he is anything other than a symbol of something else. Loathe though I am to criticise sci-fi on the grounds of plausibility, there are a number of obvious problems with the science in Chappie. Massive intelligence does not equate to emotional self-awareness. Consciousness is not something that be written into a .dat file. Often, in science-fiction, asking questions about the plausibility of the fiction is a sign that something else is wrong, that you are not being sufficiently carried away with the story to suspend your disbelief. And you don’t suddenly declare in a fable, ‘Hey! A fox can’t talk!’ But Chappie does not pose complex, or even clear questions about AI, and you wonder if it needed to be a story about robots at all. Chappie is a fine film, and an entertaining allegory on human violence. 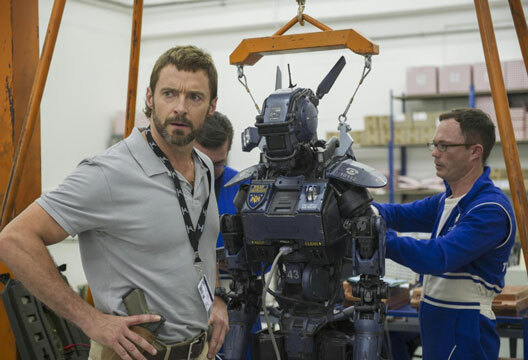 But the questions posed by Chappie himself are negligible, and so the film feels a little too two-dimensional, because without saying much interesting about AI, the film is left with the rather prosaic point that ‘violence begets violence’. More science would have helped this fiction immeasurably. But here’s hoping Blomkamp lets rip with radically less-credible themes in Alien.